If you’re captured or imprisoned, you’ll need to Break Out. This ought to be loads of fun! There are three elements to a Breakout scene: designing the prison, formulating an escape plan, executing the plan, and determining whether or not you’ve succeeded. First design the prison! This is much easier than it sounds – it chiefly means working out the special features of the prison you’re in: which is to say, the types of breakout plans it’s immune to. To do this, roll 1d, 1d to randomly eliminate one element from the “Elements of a Breakout Plan” Table, below, and then continue down the list eliminating each element beneath it until you’ve eliminated a number of elements equal to Perilx2. If you reach the bottom of the list, just keep counting down from the top. Secondly, come up with an escape plan! Choose as many elements as you like, and string them together into a plan. You can only choose each option once. The longer and more elaborate your plan, the larger bonus you get on your final Break Out roll – but the more chances of failure along the way! Thirdly, execute your plan by completing all the elements in order. Most require two skill rolls, each against a different appropriate skill. All skill rolls are at a penalty equal to Peril – and, generally speaking, no other situational modifiers apply. Each element that succeeds grants a +1 bonus to the group’s final Break Out roll and a +2 bonus to one of the made during the next element of the plan; critical success doubles these bonuses. Each element that fails gives a -1 penalty to the group’s final Break Out, and a -2 penalty to all the rolls made during the next element of the plan; critical failure doubles those penalties. Finally, make the Break Out roll for the group. This is a quick contest between the highest skill used during the breakout and 12+(Perilx2), modified as above for the success or failure of the various elements of your plan. Remember that all skill rolls are at a penalty equal to Peril! 1-2, 1 Map the layout of the prison Either remember the prison layout with an IQ roll or Eidetic Memory; or survey it live with an ability or spell like Wizard Eye. Map the layout with Cartography. 1-2, 2 Work out the guards’ routine Observe the guards’ schedules and habits with Observation – or deduce it by using an appropriate Psychology specialty. Work out how to take advantage of the routine with IQ or Tactics. 1-2, 3 Get the guards on your side Find an opening by getting a “Good” or better reaction roll, or by using an Enthrallment skill, mind control magic, or similar. Convince them to help by using a social skill like Diplomacy, Fast-Talk or Intimidation – or else by using mind control magic. 1-2, 4 Overpower the guards Sneak up to them using Acrobatics, Shadowing or Stealth – or rush them by rolling against 5x(Move-3). Knock them out by using an unarmed fighting skill – or use a weapons skill at -2, if you’ve improvised a weapon as per “Scrounge up materials,” below – or just use your weapon, if you now have it. 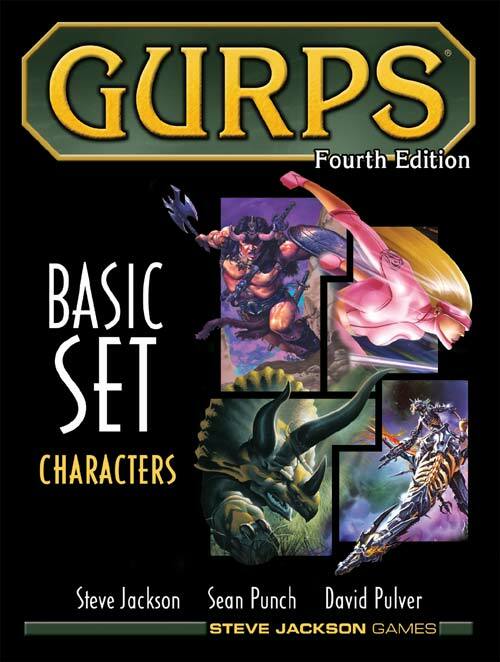 See also GURPS Martial Arts pp. 224. 1-2, 5 Slip or break your bonds Slip your bonds using Escape, or break them using ST-2, an Innate attack, offensive spell, or similar. Either evade the guards by using Stealth or make them back down by using Intimidation. 1-2, 6 Scrounge up materials for a device Find materials with Scrounging. Assemble the device by using appropriate craft skills. 3-4, 1 Pick the lock Find a lockpick with Scrounging – or succeed at Holdout and declare you have one already! Pick the lock using Lockpicking. A spell like Lockmaster can also be used to cover this whole element! 3-4, 2 Break down the door Break it down with a ST roll at -2, with bonuses for Forced Entry as per p. B196 – or use an Innate Attack, offensive spell, or similar. Either evade the guards by using Stealth or make them back down by using Intimidation. 3-4, 3 Play dead Make like a corpse by using Acting or Meditation at an additional -2, or by using Body Control at +2. Roll vs Will or Meditation to maintain the ruse for a long periods, under tough conditions. 3-4, 4 Pretend to be someone else Get the look by using Disguise, an Illusion Disguise spell, or similar. Convince your audience using Acting. 3-4, 5 Stow away Sneak into a crate, wagon or similar using Stealth. Stow away using Concealment or Smuggling. 3-4, 6 Dig a tunnel Plan a stable tunnel using Architecture or Engineering – or by using Mining at +2. Conceal all that dirt you’re digging up by using Concealment, Holdout, or Smuggling. 5-6, 1 Cause a collapse Find a structural weakness using Architecture, Engineering, or Mining. Break down whatever’s supporting it using ST at -2, an Innate Attack, offensive spell, or similar. 5-6, 2 Find an unguarded exit Find a disused area or secret passage using Architecture, Engineering, Mining, or an appropriate Hidden Lore. Sneak to it using Stealth. 5-6, 3 Cause a diversion Create a ruckus using pretty much anything! But if you use something that doesn’t give away your position, such as much Illusion magic, gain a +2 bonus to the next roll. Sneak out of the immediate area with Stealth – or flee it by rolling against 5x(Move-3). 5-6, 4 Get help from outside Roll Frequency of Appearance, modified by Peril, for an Ally, Contact, or Patron. This could be pretty difficult, so it’s the only step here. You can also get help from an Enemy in the same way – but then you will owe them! They will force you to complete another adventure, at one great Peril than the Escape, with no Reward. 5-6, 5 Recover your equipment Locate your equipment with Architecture, Scrounging, an appropriate Psychology specialty, or a spell like Wizard Eye. Get access to it by using Holdout, Lockpicking, or Stealth – or else use a ST-2 check to break in and get it. 5-6, 6 Something else! Your choice! Your choice! No Equipment During a Break Out! When Breaking Out, none of the PCs are considered to have their equipment with them, unless someone manages to complete a “Recover your equipment” element. But if the group succeeds on its final Break Out roll, then everyone gets their equipment back – a successful Breakout should involve recovering equipment! Create some new characters, and run an adventure to rescue the old ones! Have the Villain manipulate, mind control, or blackmail the characters into working for Evil! Roll up another adventure, with no Reward. Make another breakout attempt. There are no additional penalties, but there is a catch: you can’t use any of the same elements in your escape plan!